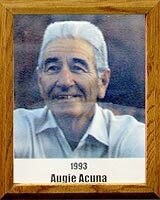 If you’re one of the thousands of youngsters who got one of those free passes to a Cleveland Indians’ spring game over the years, you owe a tip of the old baseball cap to Augie Acuna. He’s one of the guys who helped talk the County Board of Supervisors into sponsoring that program. As one of the directors of the Pima County Sports Authority. Augie was also instrumental in bringing the Colorado Rockies to Tucson. Beginning with his baseball and basketball days at Tucson High School (1938) and the University of Arizona, University of California and Cal State, Augie’s contributions to sports makes and impressive roster. Augie played on district and state championship Jr. American Leagion Baseball teams; was semi-pro in the Tucson City League; was on championship teams for the S.P. “Rails” and “Aztecas”, Tucson All-Stars and R.A.T. Clubmen; and played City AAA fast-pitch baseball and softball. Augie officiated WAC baseball and basketball for 27 years, as well as Babe Ruth Baseball, including two World Series. Another of Augie’s most satisfying invlvements has been with Special Olympics and Senior Olympics. As Sports & Playground Director (for 15 years) and Recreation Superintendent (for 20 years), Augie was responsible for organizing baseball leagues, tournaments and clinics, as well as track & field meets for 48 schools in Pima County. In recognition of his many contributions in baseball, basketball, softball, track & field, soccer, swimming and more, Augie Acuna County Park is named in his honor. In 1981, Augie was inducted into the Southern Arizona Baseball-Softball Hall of Fame Foundation.